This 1 1/4 inch Diameter kill button has the word kill engraved on both sides and highlighted in white on red. The thickness of the button is about 1/8 inch thick. This is the same one as used in the casino. Popular in Texas Hold'em Games, if a player wins 2 hands in a row, the wager amount is doubled. 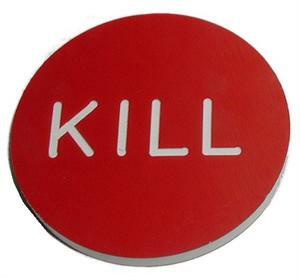 Any player who wins a pot holds the kill button. If that player wins a second consecutive pot then the wager amount is doubled for the next game only.